Now it is acceptable to talk about the 'Big C', I can tell you just how much I am already getting into the festive spirit. And I am not talking about back in April when my son requested to watch 'The Snowman and the Snowdog'. On repeat. In April. Did I mention that? I became seasonally confused. Since it is November I have no qualms about turning that short film on, even if I can't bear that first the dog dies and then the snowman melts. Christmas songs have been playing in shops for a while now. And have you heard that Sia has a Christmas album!? Every day is Christmas! I have enjoyed mulled wine and mince pies and dancing around the kitchen. The nights have well and truly drawn in and the blinds are pulled closed by 5pm whilst the children enjoy sitting on the sofa, snuggled in cosy blankets. 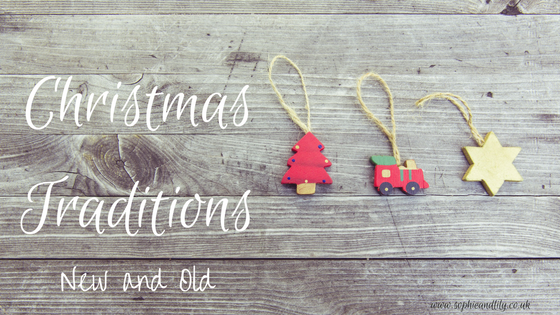 I have been reflecting on our Christmas traditions and wondering whether I can adapt any or add some completely new ones. I don't think it is too late, but I will need to get my planning hat on. Cringe or cute? Worn for one week, if not more. I'm all for them, whether they be bejewelled with sequin penguins and snowflakes or showcasing complete woolly fir trees with baubles. Matching Christmas jumpers are even better, in my opinion. This year will be the first Christmas where I can dress all three of my kids in the same jumper which I am really looking forward too, plus all of the photograph opportunities. They are only little once after all. 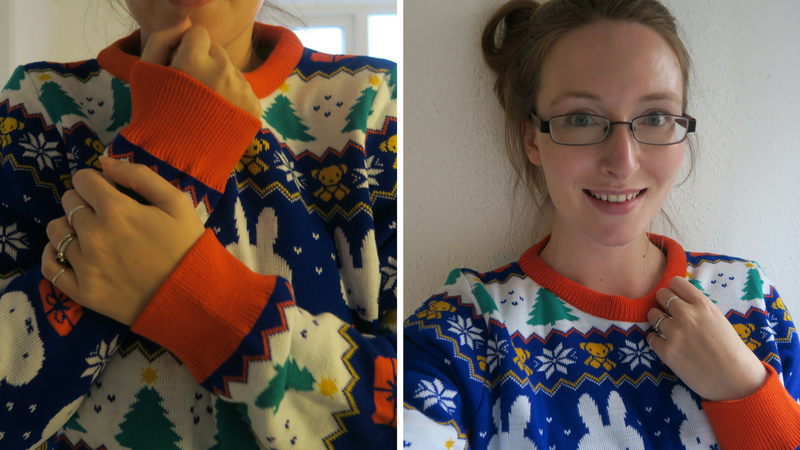 This year I will be sporting a Fair Isle Miffy jumper. As you can see, I am quite pleased! 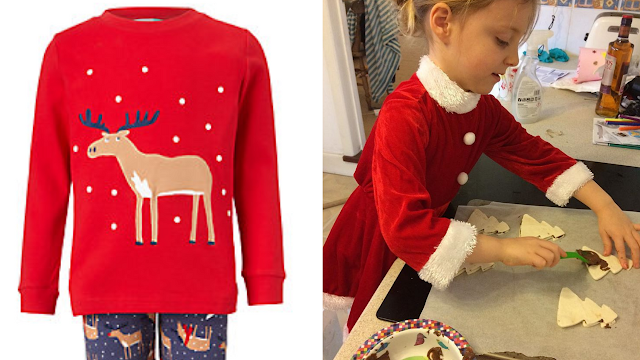 Along the same line of the jumpers, I also tend to buy my children festive pyjamas. We don't give them on Christmas Eve within a 'Christmas Eve Box', but rather at the beginning of the month so they can actually get some use beforehand. I just have to make sure that they are all clean and ready to be worn on Christmas Eve so they are all matching for the Big Day. Sure they will get chocolate coins all over themselves but nevermind. We started a new tradition last year; Lily dressed up and we made Nutella Christmas trees for our breakfast. Delicious with a hot cup of coffee, or hot chocolate for the kids. 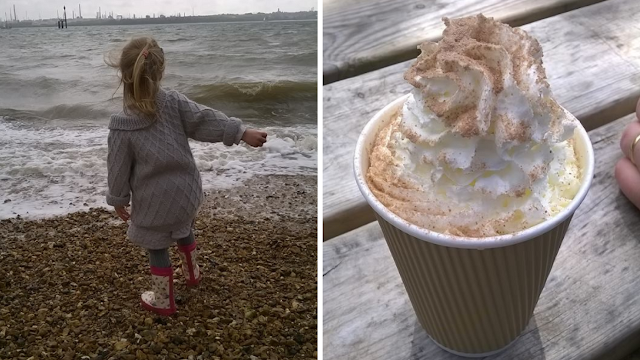 Last year we had a lovely walk at Victoria Country Park in Netley and the kids let off some steam. It was good to get some fresh air and we also bumped into many familiar faces so it was a good opportunity to chat and wish them a Happy Christmas. I was very pregnant on that particular walk, but I had a go on the zip-wire (carefully) anyway. It may have helped, as I had our second daughter later that night! I'd like to go again this year, but with the baby. Perhaps I will take her on the zip-wire to reminisce. We've enjoyed roast duck for the past couple of Christmas Eve's, but as the day now also marks Freyja's birthday, the menu will no doubt adapt to her liking. And include birthday cake, of course. Lily and Alexander adore the magical time of the evening, when after they have got into their festive pyjamas, they choose a plate and a glass and arrange a mini-feast for Father Christmas and his reindeer. It seems he enjoys whatever drink is available, the mince pie goes down well, but his reindeer always make a bit of a mess once they have gobbled up the carrot and oats. The children discover a trail of oats on Christmas morning which makes them giggle. Do you have any special festive traditions?